For anyone who spent a youthful pizza party in a local arcade as a kid, the Bell Qualifier Command Helmet will ring true. 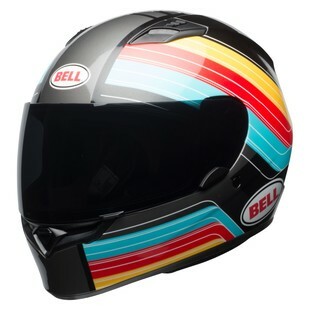 It’s retro meets right now in a entry-level helmet for those who are looking for DOT approved headgear with attitude. For years now the Qualifier has been a leader for the Bell team. It’s success comes from its high-value composition that allows riders to get a large return in features on a minimal investment of dolla-dolla bills. The Command graphic adds a bit of high-contrast vibrancy to the lineup in a way that both makes things interesting, and also works to increase the visibility of the rider on the road. Additional features of the Command helmet include a lightweight polycarb outer shell, contoured cheek pads, NutraFog II faceshield, and an industry-leading five-year warranty from Bell. For those of us who grew up in the 80’s and early 90’s, this helmet will always be cool. For those who did not, grab the remote, flip to VH1 (if that still exists), and catch up on the most fly time for tv shows, music (and music videos), and style.